How does the "rook" compare with the "franchise"? 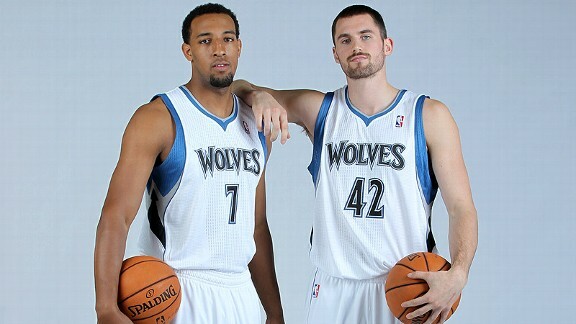 Anyone else disappointed with the season the #2 overall pick is having for the Timberwolves? Derrick Williams had some serious steam going into the draft of possibly being the #1 overall pick ahead of Kyrie Irving. Well, I think I speak for many TPup fans when I say that I've been underwhelmed by D-Will so far. There have been flashes of brilliance on alley oop finishes with Rubio, there has been nice parts of game where he looks like he has a nice all around game, but then there is the rest of the time, when he lopes back on defense, air balls what seems like 1 out of 3 three point attempts, can't finish at the rim and then wonders why his playing time isn't around 30 minute per game. With all of that in mind I wanted to look at another power forward who many worried about not ever transitioning into an all star caliber player after being drafted high, Kevin Love. If you haven't been paying attention, things are working out pretty damn good for K-Love right now. So, in the spirit of the Rubio Watch comparisons I've been doing, let's look at Derrick Williams vs. Kevin Love at equal points in their rookie seasons with stats from Basketball-Reference.com. A bit more impressive as a big reason many are down on Derrick Williams right now is that they are comparing him to Rubio on his own team, and Kyrie since he was taken right after Irving. Those two players are getting huge minutes in comparison to Williams and aren't trying to play time at the same position as an All Star in Kevin Love and past #2 pick Michael Beasley. Unlike Rubio, Williams hasn't been playing pro since he was 14, and with that he was less prepared come the beginning of this season with the lockout and a new coaching staff coming into Minnesota that he wasn't able to work with except in the short training camp. Speaking of Kevin Love, let's check his numbers in his rookie year at 29 games completed. Outside of rebounding, the entire year PER (Love improved greatly in his numbers as the season progressed, ending it averaging 11 pts, 9 rbs so this is skewed a bit from what he was producing after 29 games) DWill actually matches up nicely with the Wolves current franchise player. How many Wolves fans at this point in Love's rookie year were panicked over his shooting percentages? How many thought that in 2012 he might be the best three point shooter on the Wolves team (both a compliment to Love and a rip on the lack of great shooters on the current roster)? Or competing in this year's three point contest at the All Star game? To me, you have to look at these numbers and take away the comparing of DWill to Rubio or Irving, whose situations are vastly different from Williams and just look at Williams and realize that many other rookies have struggled in their rookie year's and turned into great players. So don't give up on Williams, while I hope he doesn't run Love off as Love did with Al Jefferson who was already playing PF when Love was drafted, it could happen though. For now, let's slow down making our final judgments on DWill and allow him to season a bit and find his spot (hopefully a SF to compliment Kevin) in the NBA just as Love did.